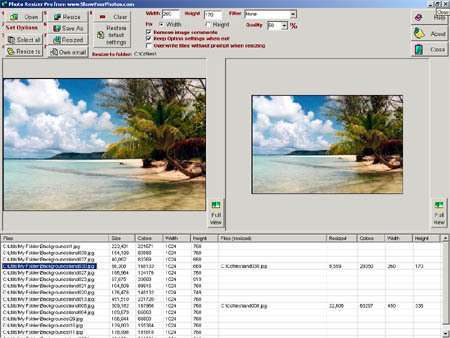 Photo Resizer Pro is software to resize photos and images for the purpose of email and web sites, or just to save space on your hard drive, or whatever reason you might have. There is no need to open a photo editor or email-client. Photo Resizer Pro offers you numerous advanced features. All resized photos are saved as JPG in the selected folder. You can click on any photo (or on more than one) to save it as another format. Each format has an "Advanced section" for further options. The aspect ratio will be maintained. In the event of you resizing more than one photo you must fix either the width or height to the size you preselected. Resize with different filters to see the result. These filters will help a lot when you resize bigger than the original. Most cameras add information about aperture, light, comments and much more to the photo. You can delete this to reduce the file size even more. Overwrite files without prompt when resizing. If you resize the same list again you can overwrite the files. Send email with software supplied with this software. Type the address and click the "Add name to list" button. You can add more photos to send and select to reduce the size for your purpose.